4. Last month, my car broke down – the alternator belt broke. While talking with the mechanic, I didn’t know the word for alternator, couldn’t remember the word for belt, and found myself stumbling over all the Arabic I was trying to produce. The mechanic looked at me blankly. Complete communication breakdown. I don’t understand all of the Arabic being spoken around me. Yet. People don’t always understand what I am trying to say to them in Arabic. Yet. I don’t read Arabic fast enough to be able to stay as informed of current events as I would like. Yet. My handwriting in Arabic hasn’t become natural enough to make people not smile when they read it. Yet. Does that surprise you? Does it make you think that somehow I am a failure? Or does it make you fear that your own efforts to learn Arabic will result in failure? It shouldn’t do either. 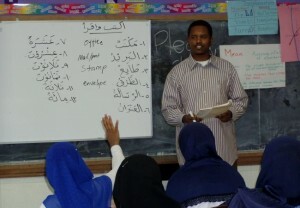 I am proud to say that I have learned all kinds of Arabic, and I am on my way to learning even more. That’s part of the reason I called my blog “the Arabic Learner”. A fixed mindset believes that each person’s level of intelligence and ability is fixed, and can’t be changed. A growth mindset believes that anything can be learned, and that personal abilities can grow through effort. A fixed mindset fears failure because it believes that failure indicates a lack of gifting or talent. A growth mindset embraces mistakes as a learning tool. A fixed mindset avoids challenges. A growth mindset doesn’t always enjoy them, but knows that they are beneficial. A person with a fixed mindset feels successful and validated when they can do something better than other people. A person with a growth mindset feels successful and validated when they are making progress in something difficult. A fixed mindset says, “I can’t”. A growth mindset says, “I can’t… yet”. Making mistakes is an essential part of learning. You need to give yourself the freedom to make mistakes as you learn Arabic in order to continue learning effectively. That may sound simple, but it is surprisingly hard for most of us. For a person with a growth mindset, making mistakes and getting feedback about those mistakes is essential. Whether that feedback comes in a nice way (gentle instruction, personal realization) or in a less enjoyable way (harsh criticism or the dreaded laughing at your attempt to communicate), rather than feeling judged and graded they see the opportunity to leap forward. Without mistakes there can be no progress. From the Connections Academy Blog. In last week’s post, I looked at the need to embrace ambiguity as you learn Arabic. 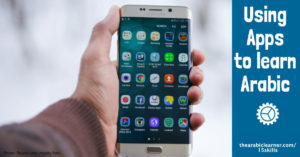 Ambiguity is something that we come across as we use our receptive skills (listening and reading), when we don’t fully understand what is being communicated. We need to take risks and put ourselves in situations where we don’t fully understand everything. In a similar way, this week’s mindset skill of “making mistakes” deals with our productive skills (speaking and writing). The concept is similar, but the risks – of looking and feeling foolish – are even higher if you have a fixed mindset instead of a growth mindset. But with a growth mentality, you will realize that making mistakes opens you up to feedback and improvement. Challenge brings expansion and increase. The greatest danger when it comes to mistakes is not that you might make them. It is not in having your language misunderstood, or in feeling judged and evaluated as a person. 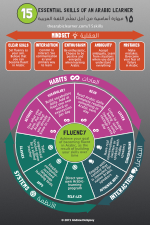 The greatest danger in mistakes, when it comes to you becoming fluent in Arabic, is NOT making them. 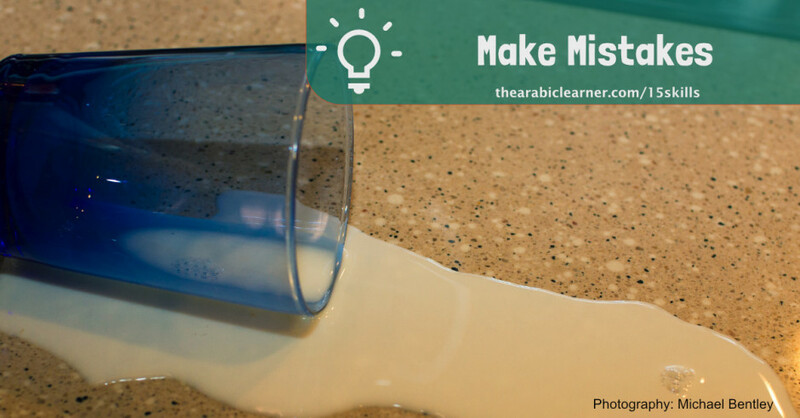 It’s not surprising that the Arabic language teaching experts I consulted with frequently mentioned that a willingness to make mistakes was a common characteristic of the most effective Arabic learners they had seen. For example, Laila Al-Sawi (co-author of Kalaam Gamiil, An Intensive Course in Egyptian Colloquial Arabic, and Al-Murshid: A Guide to Modern Standard Arabic Grammar for the Intermediate Level), talked about one of her students who had lived with an Egyptian family as he learned Arabic. The family had a small child, and the word that the student learned for “water” was the word “mboo”, which is Egyptian baby-language for water or a drink (actually the origin of the word is Coptic – I had a link to this but I can’t find it right now… will update when I find it). When the student used the word in the university cafeteria to order a drink, he was laughed at. But he went on to become a very strong Arabic speaker. To be clear, mistakes and ambiguity are not valuable in and of themselves. Their value comes when they are recognized and used as a learning tool. This is a good point, and brings up the importance of the learner actually taking steps to overcome the ambiguity or mistake. There are two main ways that you can benefit from mistakes. Both are important. a verbal response such as eeh?/إيه؟ (what), na3am? / نعم؟, etc. When you notice this kind of response, make a mental note of what you just said, and come back to it later to find out what it was in your expression that caused the difficulty in them understanding you. Was it your pronunciation? Word form? Choice of vocabulary? Context? Something else? Take a moment to evaluate the clues. If you are able, ask the person to help you understand what you said that wasn’t clear. Feedback that is solicited is easier to receive than feedback that is not solicited. You will likely receive both, and both can be helpful. Solicited feedback often comes in classroom settings, or with tutors. In this situation, it is the job of your teacher/tutor to note various mistakes that you make, and give you appropriate feedback. According to Laila Al-Sawi, this kind of feedback is an important part of avoiding “fossilization” – the permanent incorporation of mistakes into your Arabic. Unsolicited feedback is more difficult to appreciate, but can also be very valuable. It may come in a direct form, such as someone telling you that you said something wrong, or in an indirect way, such as someone laughing at you. Although it is never particularly pleasant to get this kind of feedback, learners with a growth mindset will not be put off by it, and will learn from it. The bottom line is that making mistakes as you learn Arabic is important, and allowing yourself to make mistakes and learn from them is a key skill for an Arabic learner. Do you have a fixed mentality, or a growth mentality? Which one do you believe is fundamentally true? Do you need to read more on this subject? Can you recall any mistakes you made in Arabic that proved to be valuable, in terms of the feedback you received from them? What is your greatest fear about making mistakes? What can you do this week to allow/encourage yourself to make more mistakes in Arabic? Personal interview with Laila Al-Sawi, May 14, 2015. Hossam Mohammed Ebaid, posted to The Arabic Learner Facebook page, 19 February 2016. I guess I make a lot of mistakes in speaking Arabic. One glaring one, several years ago, was in trying to say, “I can see you” and actually saying, “I can kiss you..” Pretty embarrassing, that one! But for ages I was puzzled by the somewhat patronising smile that appeared on the faces of people I spoke to even when I had not made a mistake. I finally resolved the puzzle when I heard a recording of my voice in Arabic. I had to read an English novel on the radio for children studying for an exam. There were several parts to the reading, which was broadcast as a series over several days. So I had to start each recording by saying its number for the benefit of the studio technician who would put it on. “Al halaqa al oola, al halaqa al thany,” etc. I was shocked when the recording was played back to me. I was brought up mostly in England and did not think my voice had a twang in it. But I sounded like somebody from the US! I then realised that the sound box for Arabic was the chest while English sounds apparently come more from the head. Haha, I can picture you saying “mumkin aboosak”… “I can kiss you”. I guess the embarrassment level depends on who you are speaking with? How interesting about the chest and the head. Is US English spoken more from the chest than UK English? I will plead being Canadian here. Perhaps we speak from our larynx? We are usually in the middle between US/UK on most things! No, not at all. US speech, unless the speaker comes from the deep,deep south, sounds terribly nasal. The closest you get to that in England is in the west country, down Devonshire way and my only connection with Devon was to hitch-hike through it one summer on the way to Cornwall. But these recordings were really v strange. Once I’d got past the Arabic numbering my voice sounded okay, normal, from the throat and chest . 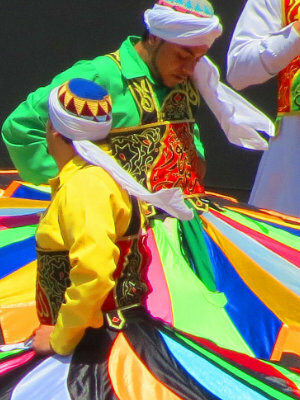 After that I started making a conscious effort to deepen my voice when I spoke Arabic, which made our sons laugh. Incidentally, a great many Germans have really deep voices. Really great article, Andrew. …and really encouraging to see that even after all this time and experience you are still learning from your mistakes and not getting discouraged. For me, after a dozen or so years in Egypt, I haven’t attained the fluency that I wanted by now. Actually, I have found that I hardly speak Arabic these days and getting more reluctant to do so because I should be better by now. ..>BUT…you have encouraged me to get back on track and make those mistakes …and to learn from them. Thanks Ameena, glad to know that was encouraging. I think what you describe is a common emotional response that many people get after passing a certain amount of time in which they “should” have learned Arabic. Since we feel we didn’t meet whatever goal was in our brain as a reasonable amount we should have learned, we get feelings of failure and then trying to speak in Arabic just compounds that.